Having the same e-mail twice is bad enough. Bad what happens if you have the same e-mail twice in your Outlook – but in different folders? This might happen if you answered your e-mails, moved the originals and then, for same some reason, downloaded them again by accident. Not a big thing, 1-Click duplicate delete for Outlook can fix this easily. That’s all, the program will do the rest, scan your mail folders and recognize and remove the duplicate e-mails. Try it now! Download 1-Click Duplicate for Outlook. Yes, Easy2Sync has some special terms, because some very special things can happen during the synchronization (both for file synch and e-mail synch).. Want to know what that means? Simply press F12 (which open the options), and on the first page wait with the mouse cursor over the synch case item you want to know more about. A tooltip with the explanation will appear. Download Easy2Sync for Files/ Download Easy2Sync for Outlook. Posted in Files, Outlook, Sync | Comments Off on Asynchronous WHAT?? On some Windows systems, USB devices (USB sticks, USB hard disks or whatever) like to change their drive letter. It’s their idea of having fun. Plug it in and it’s E:\, take it out, plug it in again and it’s F:\. Great. How can you synchronize your files with such a chameleon? Any path that you enter is bound to be wrong, sooner or later. So how can you synchronize with it? Well, you can, with Easy2Sync. First, make sure that the device has a unique name. You can edit that it its properties, if necessary. When you’re synchronizing files, you may encounter the problem that the file can’t be synchronized because it’s locked. You can simply check “No message box on copy errors”. Try it and Download Easy2Sync for Files. How many times did you send an e-mail, but forgot the attachments? Don’t try to count, fix it! One of the many thing that ReplyButler does is to save you from this embarrassment. It analyzes your answer, and your attachments and asks you if it looks like you forgot the attachment. Automatically. 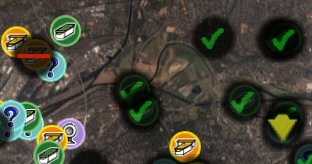 Is it safe to delete duplicates? With 1-Click duplicate delete for Outlook it is. But you don’t have to trust us blindly. It doesn’t get any safer than that! Try it now! 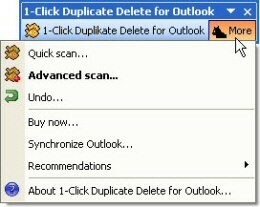 Download 1-Click Duplicate Delete for Outlook. Posted in Duplicates, Useful | Comments Off on Is it safe to delete duplicates? Now, there a different levels of file locking. Easy2Sync for Files automatically tries to make the best out of the situation and tries to copy the file whenever possible while detecting and avoiding certain risks in the involved Windows functions. But sometimes that’s not enough. Sometimes files just can’t be copied (and there may be a good reason for that). Before running the task, Easy2Sync will check if the application is running and ask you to close it, so that the synchronization can take place. This is useful for example for database applications. A new release of the text automation utility ReplyButler is now available. It fixes a problem with the default settings for the name recognition, improves the language recognition and improves the name recognition in some special cases. ReplyButler is a great tool for everybody who writes a lot of e-mails and looks for an clipboard shortcut program that’s specialized on e-mails. You can get a free test version here: Download ReplyButler! Example 5: Only files in the root directory and in the folders “src” and “res” should get synchronized. These folders are at top level. Example 5: Only files in the root directory and in the folders “src” and “res” (and their subfolders) should get synchronized. These folders are at top level. Yes, it’s release time. Now it’s the turn of Easy2Sync for Outlook. There are quite a few changes this time, like UI improvents, a second trigger folder, a new task type and enhanced Vista compatibility.